The School of Dentistry (SOD) celebrated another milestone year in 2018. With impressive gains in every aspect of our mission and several noteworthy accomplishments for such a young school—founded in 2013—the SOD continues its forward momentum. The SOD graduated its second-ever class in May 2018. When admitted, this group of 23 students had the 2nd-highest incoming GPA in the country. They finished with a 100% pass rate on national and regional boards, as well as a 100% graduation rate. The SOD reached full class size with 50 first-year students admitted in 2018. The Class of 2022 is the largest, most diverse class and has the highest percentage of women students in SOD history. Finally, in 2018 the Commission on Dental Accreditation (CODA) awarded the SOD with full accreditation status without reporting requirements. This is an outstanding achievement for a new school in its first accreditation cycle. With funding from the Health Resources and Services Administration, the SOD continued providing comprehensive dental care to patients in treatment programs for substance use disorder. Preliminary outcomes from research associated with this care proved better than expected. Patients who received comprehensive dental care and substance use treatment stayed in treatment programs twice as long and upon discharge were three times more likely to be employed, two and a half times more likely to be drug abstinent, and half as likely to be homeless compared with a control group only receiving treatment for substance use disorder. These preliminary results could fundamentally change the way we think about and treat addiction. The School of Dentistry has steadily increased its NIH funding, earning $1.4 million in Fiscal Year 2018. Out of 66 accredited dental schools in the US, the SOD is No. 30 in NIH funding as of 2017 (the most recent year with available data). To be top-30 in research funding after only five years is a testament to the hard work and perseverance of the SOD’s research faculty. With additional legislative appropriation funds in 2018, the SOD partnered with the dental hygiene program at Dixie State University in St. George, Utah. 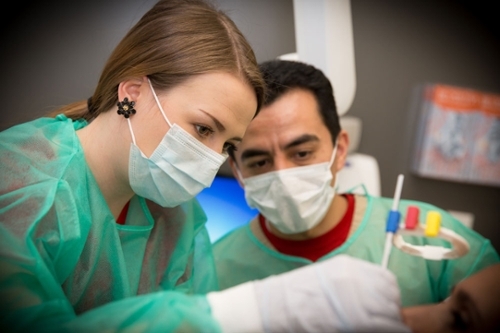 This allows dental students to provide care to underserved patients in southern Utah. Generous donor funding allowed the South Main Clinic to add four dental chairs to its clinic. The SOD has a permanent rotation at this clinic to serve the patients who come through this clinic (primarily women and children). The School partners with the Deptartment of Pediatrics and Salt Lake County to provide care to underserved patients at South Main. Also in 2018, the SOD became the first dental school in the country to institute an integrated health record, implementing the dental module of Epic, (Wisdom). Dental providers now have access to patients’ medical records and vice versa. The integrated health record will allow dental providers to give better comprehensive care and will open the doors to future health outcomes research. During the 2018 legislative session, Utah lawmakers voted to extend dental Medicaid benefits to patients in substance use treatment programs. Excellent outcomes from the above-mentioned research helped bring this legislation to fruition and offer promise to Utahns who are trying to get their lives back on track. A generous $10 million gift from the Noorda Foundation established an endowment to supplement the cost of care for underserved patients. This endowment allows the SOD to carry out the wishes of the Noordas, who asked the SOD to care for those who cannot afford care. The SOD continued providing care to the community at events throughout the year, such as Give Kids A Smile and the Junior League CARE Fair. Every SOD student and most faculty members participated in outreach and service projects in 2018. The SOD has enhanced its faculty gender balance in 2018, hiring several well-qualified female faculty members. Traditionally, only about 10% of practicing dentists in Utah have been women. The SOD aims for gender balance in both the faculty body and student body. Rena D’Souza, DDS, PhD, was elected President of the International Association for Dental Research (IADR). IADR is the preeminent research organization in dentistry. Dr. D’Souza has also worked with the Surgeon General on the forthcoming 2020 Surgeon General’s Report on Oral Health. Although the School of Dentistry is a young school, the faculty, staff, and students are top-notch. Our people are working hard every day to train excellent clinicians; provide excellent, compassionate care; and improve the lives of people in our community. We look forward to another great year in 2019 and are proud to be part of University of Utah Health. 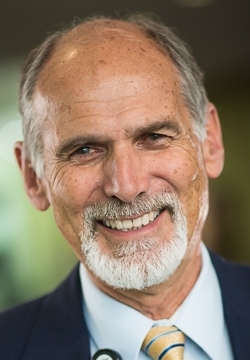 Guest blogger Rory Hume is Dean of the School of Dentistry and Associate Vice President for Academic Affairs and Education for U of U Health. An internationally acclaimed scholar, Hume previously served as dean of the UCLA School of Dentistry and as executive vice-chancellor at UCLA. He was also vice president for health sciences, provost and executive vice president and chief operating officer for the 10-campus University of California system.